Athletes who raced last weekend at the OCR World Championships in Ontario, Canada all received a personalized card, patch, and postcard in their packets this year. The card was from the newly formed International Obstacle Course Racing Union (IOCRU). This Union was created by Adrian Bijanada, Amelia Boone, and Carrie Connors. The IOCRU was created with the purpose of serving the global community of OCR athletes, promoting and developing the sport of OCR, and fostering relationships between athletes, supporters, sponsors, fans, and race organizers according to the organization's website. 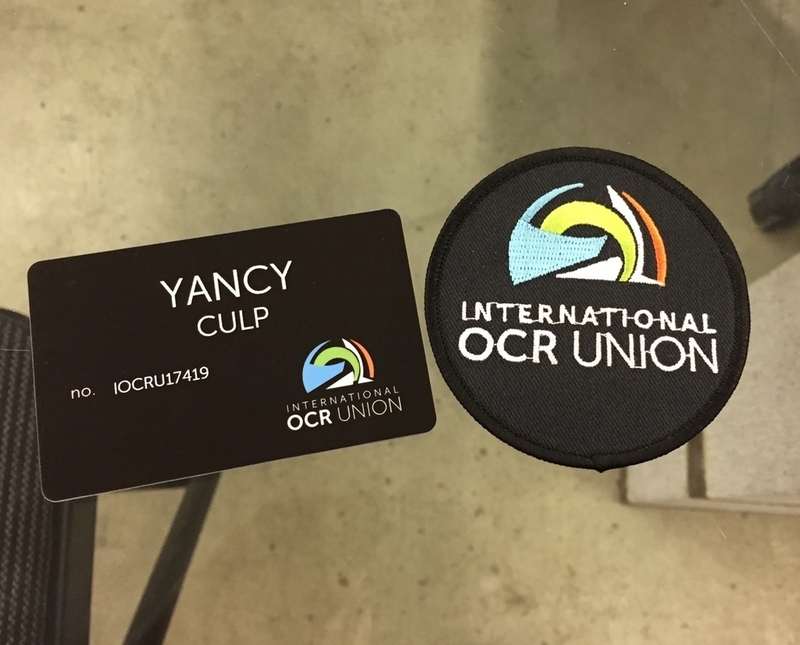 Hey, guys, we're getting a bunch of questions about the International Obstacle Course Racing Union, so I thought it time to explain a bit more what exactly it is (and how you can use those membership cards!) in a more public forum. So what is it? IOCRU is an organization started by myself, Amelia Boone, and Carrie Connors with a few simple goals in mind–first, to serve the athletes of OCR and second, to help support OCR at all levels. It is not a governing body. Simply put–we think it is needed. We feel OCR is at a pivotal moment in its history and as people with interest in seeing it succeed, we feel the involvement of the athletes first and foremost (you guys!) is critical to that success. 1. We are working towards not-for-profit status. Until that happens, we are conscious that we will not enter into any commercial arrangements with either athletes or races beyond what may be deemed a benefit to athletes (e.g. sharing a race's discount code with members). 2. Membership is entirely free and voluntary. To that end, we will begin introducing some of the benefits of membership which will include race discounts, travel perks, and more within the next few weeks. 3. We need your help. We want this to evolve into an active and positive community that advocates for the sport. Your help can come in many forms including contributing content (articles), helping to find partnerships and more. If you want to be involved shoot an email to services@iocru.com and one of us will get back to you asap. 4. Lastly, we are willing to work with ANYONE that shares our goals. It is important to us that the creation of this community not be viewed as adversarial to any one group or organization. Give us a shout with any other questions. We'll also continue to update the content above with details as they become available. As stated above in Bijanada's Facebook comment membership into the IOCRU is free for anyone in the obstacle racing industry whether they are an athlete, brand, or other supporters of the OCR industry. For more information check out the International Obstacle Course Racing Union website.